We’ve had a bunch of beets in the house lately and while I know a lot of people like to roast them, I still haven’t looked into the best recipes to do so because it’s even easier to add them to smoothie. 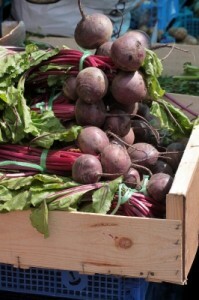 If you’re curious about the benefits of beets, you can read more here and here. Oh, and don’t forget to use the beet greens also when you’re juicing or making a smoothie because they too add a powerful burst of nutrients. Now onto the good stuff, the recipe for a delicious smoothie. What are your favorite smoothie recipes that use beets? Next post: Food Pyramid vs. MyPlate – Is The USDA Still Missing The Mark?